A Blog for Minnesota Cities: Calling All Future Leaders! How can a mayor make an impact in their city? Maybe by hosting a clean-up or tree-planting event to improve parks and open spaces, giving a speech on the importance of working for a city, or posting signs around the city sharing a message of community pride. These ideas—and more!—were featured in the winning essays from three elementary school students for the League’s 2017 “Mayor for a Day” essay contest. 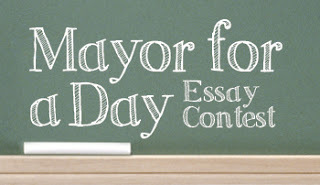 Students across the state submitted hundreds of creative ideas of things they would do if they had the chance to be mayor. Now, it’s time to sharpen those pencils and get thinking once again! All fourth-, fifth-, and sixth-graders who live in Minnesota are invited to share their best ideas about how they would improve a city service or program for the 2018 contest. Three winners will be chosen, each will receive a check for $100, and they'll have their essay published in an issue of Minnesota Cities magazine. All entries must be handwritten and postmarked by Oct. 12, 2018. Please share this with students, teachers, and parents in your community. We can’t wait to hear this year’s crop of great ideas!